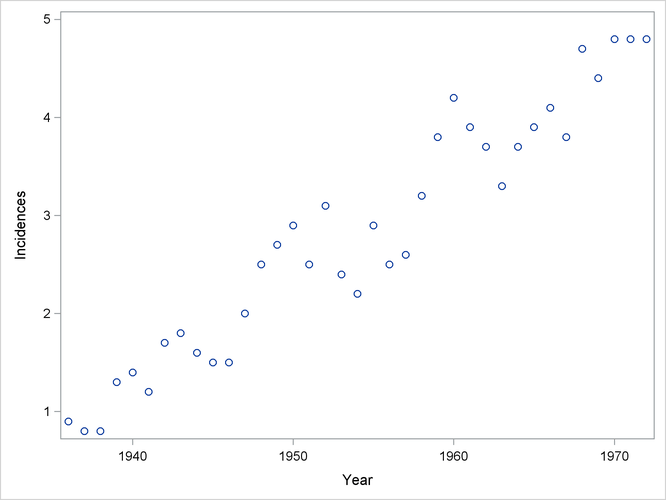 The following data from the Connecticut Tumor Registry presents age-adjusted numbers of melanoma incidences per 100,000 people for the 37 years from 1936 to 1972 (Houghton, Flannery, and Viola 1980). The following PROC SGPLOT statements produce the simple scatter plot of these data displayed in Figure 71.1. When ODS Graphics is enabled, PROC LOESS produces several default plots. 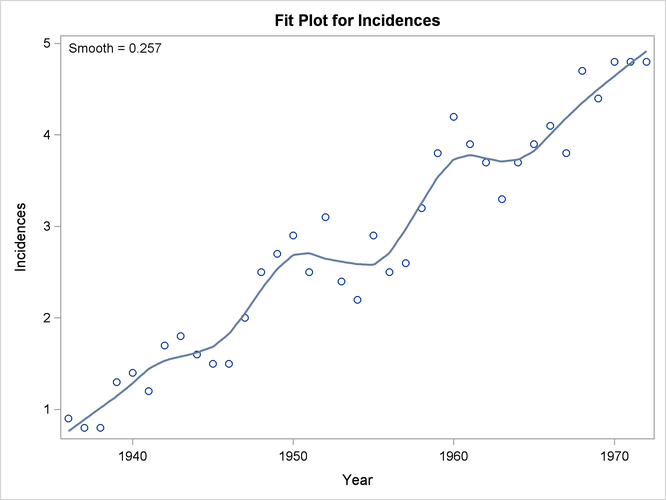 Figure 71.2 shows the "Fit Plot" that overlays the loess fit on a scatter plot of the data. You can see that the loess fit captures the increasing trend in the data as well as the periodic pattern in the data, which is related to an 11-year sunspot activity cycle. 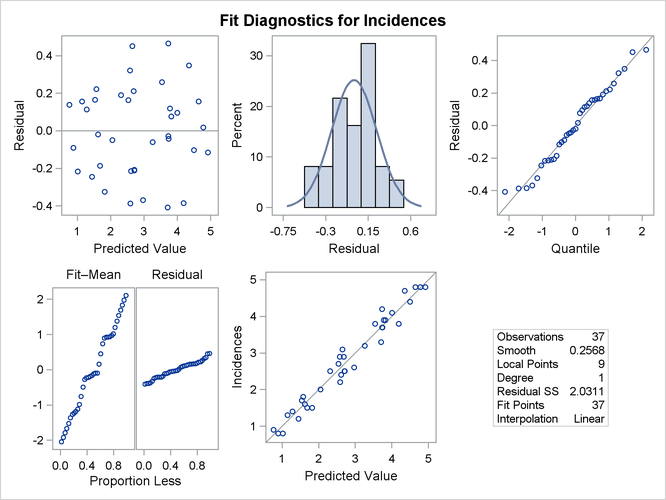 Figure 71.3 shows the "Fit Summary" table. This table details the settings used and provides statistics about the fit that is produced. You can see that smoothing parameter value for this loess fit is 0.257. This smoothing parameter determines the fraction of the data in each local neighborhood. In this example, there are 37 data points and so the smoothing parameter value of 0.257 yields local neighborhoods containing 9 observations. The "Smoothing Criterion" table provides information about how this smoothing parameter value is selected. The default method implemented in PROC LOESS chooses the smoothing parameter that minimizes the AICC criterion (Hurvich, Simonoff, and Tsai 1998) that strikes a balance between the residual sum of squares and the complexity of the fit. You use options in the MODEL statement to change the default settings and request optionally displayed tables. For example, the following statements request that the "Model Summary" and "Output Statistics" tables be included in the displayed output. By default, these tables are not displayed. The "Model Summary" table shown in Figure 71.5 provides information about all the models that PROC LOESS evaluated in choosing the smoothing parameter value. 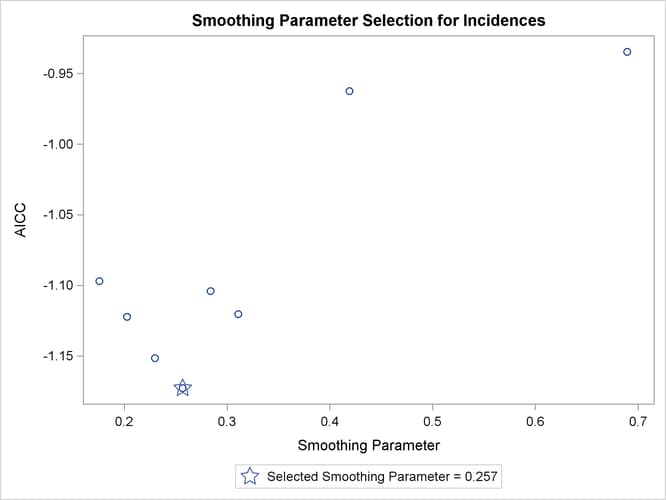 Figure 71.6 shows the "Criterion Plot" that provides a graphical display of the smoothing parameter selection process. Figure 71.7 show the "Output Statistics" table that contains the predicted loess fit value at each observation in the input data set. The RESIDUAL option causes the residuals to be added to the "Output Statistics" table. Note that, even if you do not specify the DETAILS option in the MODEL statement to request the display of the "Output Statistics" table, you can use an ODS OUTPUT statement to output this and other optionally displayed tables as data sets. If you examine the plots in Figure 71.9, you see that a visually reasonable fit is obtained with smoothing parameter values of 0.25. With smoothing parameter value 0.1, there is gross overfitting in the sense that the original data are exactly interpolated. When the smoothing parameter value is 0.4, you obtain an overly smooth fit where the contribution of the sunspot cycle has been mostly averaged away. At smoothing parameter value 0.6 the fit shows just the increasing trend in the data. 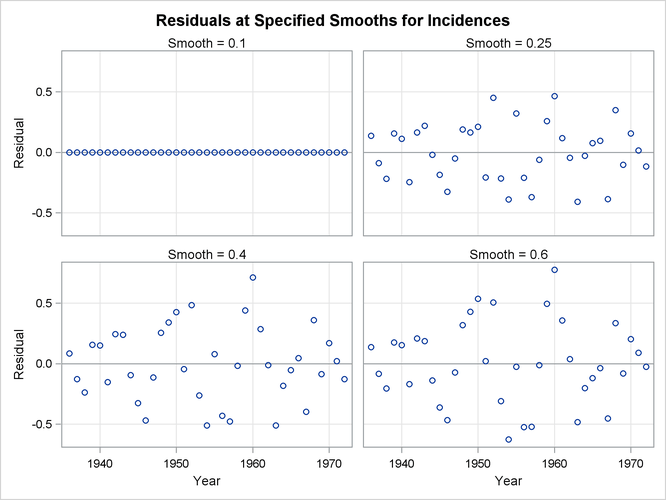 Figure 71.10 shows a scatter plot of the residuals by year for each smoothing parameter value. One way to discern patterns in these residuals is to superimpose a loess fit on each plot in the panel. 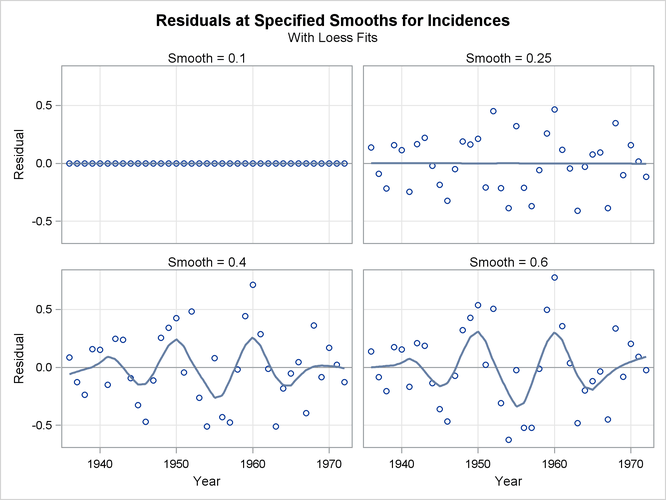 You request loess fits on the residual plots in this panel by specifying the SMOOTH= suboption of the PLOTS=RESIDUALSBYSMOOTH option in the PROC LOESS statement. Note that the loess fits that are displayed on each of the residual plots are obtained independently of the loess fit that produces these residuals. The following statements show how you do this for the Melanoma data. The loess fits shown on the plots in Figure 71.11 help confirm the conclusions obtained when you look at Figure 71.9. 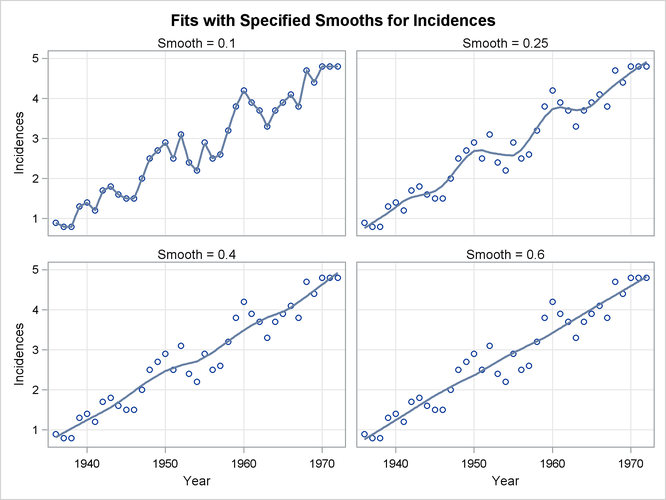 Note that residuals for smoothing parameter value 0.25 do not exhibit any pattern, confirming that at this value the loess fit of the melanoma data has successfully modeled the variation in this data. By contrast, the residuals for the fit with smoothing parameter 0.6 retain the variation caused by the sunspot cycle. Figure 71.12 shows the fit diagnostics panel. The histogram of the residuals with overlaid normal density estimator and the normal quantile plot show that the residuals do exhibit some small departure from normality. The "Residual-Fit" spread plot shows that the spread in the centered fit is much wider that the spread in the residuals. This indicates that the fit has accounted for most of the variation in the incidences of melanoma in this data. This conclusion is supported by the absence of any clear pattern in the scatter plot of residuals by predicted values and the closeness of the points to the 45-degree reference line in the plot of observed by predicted values. 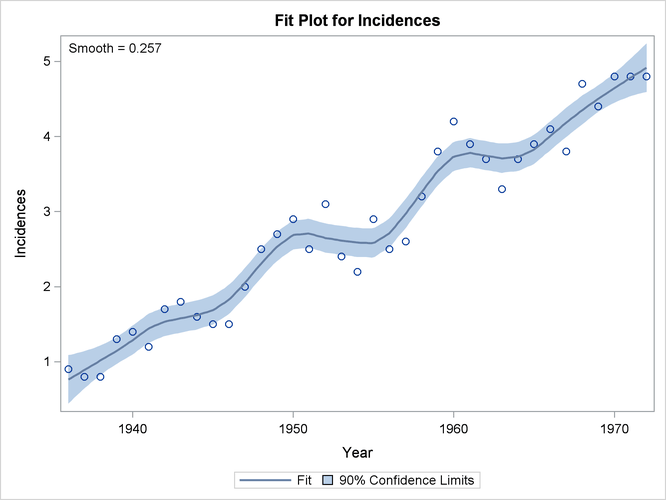 Finally, Figure 71.13 shows the selected loess fit with 90% confidence limits.